If you like this, share it! Positive economic news for the City of Red Deer, as the value of building permits has climbed 75 percent over the past year. City officials say building permits rose from an estimated $5.5 million in February of 2016, to $9.6 million last month. The number of permits increased significantly as well, from 59 to 96. Officials say although the numbers were strong in both the residential and commercial sectors, it was $1.3 million in work to Goodlife Fitness at the Parkland Mall, $500,000 in finishes to the new Giant Tiger department store and $450,000 in renovations to the Red Deer Provincial Courthouse that had significant impacts on the latest totals. Year to date totals show a more modest increase though, as there were $20.2 million in building permits issued in the first two months of 2016, while there have been $21.1 million issued in permits so far this year. With the change of season, it’s a great time to reflect on how you might want to adjust using your time and energy. How many of us have forgotten how to REST? How many of us have forgotten how to PLAY? I am guilty of not being aware of play or creating the rest I needed. I spent YEARS breathing way too fast, racing from task to task and event to event. I somehow believed that my worth was attached to what was accomplished. Leaving something undone was actually painful. Rest and play are not just important, they are critical. Researcher Stuart Brown says that the opposite of play isn’t actually work, it’s depression. Sadly, I know this all too well too. What happens to us when we don’t rest and play? Creativity suffers. Relationships suffer. Effectiveness suffers. Clarity and purpose suffer. Decision making ability suffers. Our overall capacity for resilience suffers. There is one simple metaphor that helps me choose when REST and PLAY are important: an elastic band. When we work so hard, give and parent, the elastic band is stretched with each new effort. 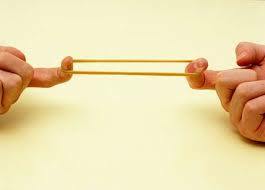 Some elastics have far more “give” and can stretch great distances, much like each persons ability to work. Be careful to not let pride and ego take over here…. elastics have a breaking point. So do we. It’s impossible to know when an elastic has reached it’s breaking point. There are clues, but sometimes they surprise us. What clues are in your life? Are you paying attention to the clues? Have you already learned this lesson, but need to learn it again? Better than stretching an elastic to breaking point, is a the use of an elastic to stretch and release. Work and rest. Play. Referring back to the body of research by Dr. Stuart Brown, play is time spent without purpose; time spent when we can lose track of time and self consciousness. For me, that usually involves being in nature or in water…. and that is where I find hope, rest, creativity and a tonne of joy. Where do you feel like you lose track of time and self consciousness? Find it and make sure you refuel. The purpose of an elastic is to stretch. For that it must contract. Work can be immensely satisfying. For that we must find rest. We cannot give something that we don’t have. What do you find restful? Where do you lose track of time? What resources do you have to employ a period of rest? Are your holidays restful and playful for you or are they a different form of work? Do you have any practices in place that allow you to shut off your phone? Give yourself what you need if you’re feeling stretched and ask yourself what is important. Get curious. Then breathe deep and make some choices. There may be hard choices at first. As you get better at playing and resting, you’ll become better at it. Todayville Top 5 is a sponsored segment produced by Jock Mackenzie (learn more about Jock below). In this feature we learn (you guessed it) 5 things about some really cool aspects of Red Deer that make this city, our home. If our very first segment, Jock features a staple in Red Deer’s dining scene since it opened in … well let’s leave that up to Jock. 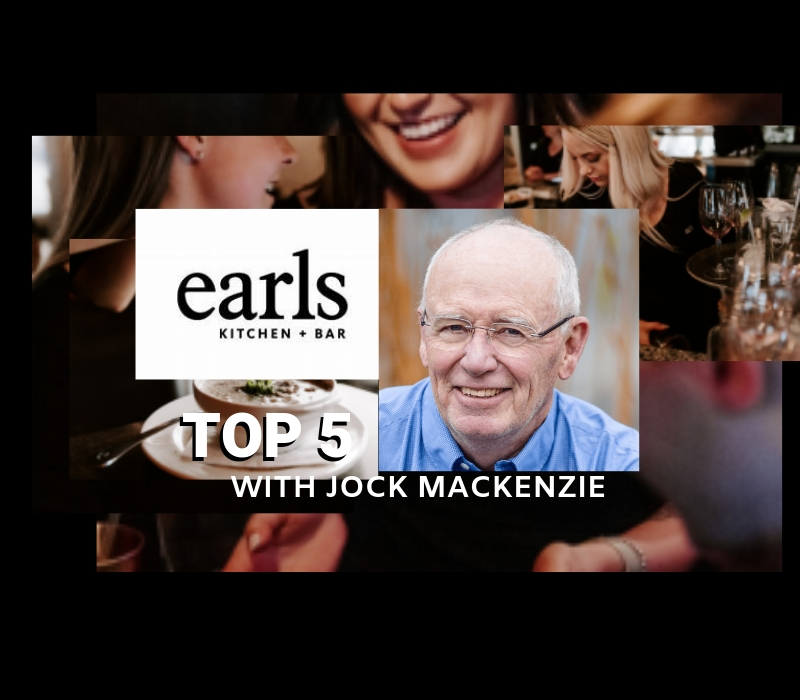 Welcome to the Todayville Top 5 with Jock Mackenzie. Earls in Red Deer was the seventh-ever Earls in existence. Bill and Rhonda Olafson purchased the franchise and opened the current restaurant in 1984. Chef at the time, Andrew Lam, is still involved. Over the years, additions to the west and north have been added as has the covered, heated patio. The patio is unparalleled by other outdoor dining facilities for comfort and its Hawaii-like greenery. Today there are over 70 Earls restaurants across Canada and the United States. The founder, Leroy Earl “Bus” Fuller, brought A & W to Canada and is also the founder of the Fuller’s and Corkscrew restaurant chains. Giving back to the community is a cornerstone of the Earls Red Deer philosophy. Those in need come first: rebuilding the youth camp at Camp Alexo, the Youth and Volunteer Centre, support for the Women’s Shelter at their annual gala, title sponsorship for the last six years at Rotary’s Black Tie Bingo, a 5-year ongoing plan to support the new Child Advocacy Centre, wine and wine service at the preview dinner for the Festival of Trees since the Festival’s inception . . . and many more. With over 80 people on staff, Earls has provided employment for high school and college students over its 35 year history. The Earls philosophy, the practical skill set, and menu knowledge make up the intensive training each support staff and server undergo. Consistency is a hallmark. Numerous staff members have made life careers at Earls–and that’s one reason why you can count on a great meal every time. Fresh ingredients are key! The kitchen deals with “just in time” orders so that produce and proteins (delivered three times per week) come fresh to each table. The menu is becoming more and more inclusive–it meets an ever-increasing variety of dietary needs: numerous gluten free and plant-based options are available. Beer? Earls brews its own Rhino beers (pale ale, lager and a seasonal beer) in Surrey, BC at Central City Brewery. There are also local products from Troubled Monk, Blindman and Snake Lake as well as a wide variety of domestic beer. Four Earls “Test Kitchen” chefs travel the world looking for new ingredients and dishes. A “Test Kitchen” in Vancouver will roll out a new dish and tailor it to an appropriate market in the 70 locations across North America–the furthest away is Miami. Todayville Top 5 features the freelance writings of Jock Mackenzie. Jock is an original Red Deerian! Educated at Lindsay Thurber and Red Deer College (with a stint at the U of A), he became an educator himself, spending 31 years with the Red Deer Public school system. It’s safe to say Jock knows Red Deer about as well as anyone (OK.. maybe not Michael Dawe). As a confirmed life-long learner, Jock never tires of getting to know his surroundings even better. That’s where the Todayville Top 5 comes in. In each feature, Jock shares a few ingredients that go into the mix that makes this delicacy called Red Deer the place we want to call home. As a well organized person who knows you’re busy, he’s choosing just 5 juicy tidbits to share each time. If you’d like to be featured by Jock Mackenzie on the Todayville Top 5, just contact us at info@todayville.com. Doors open at 5:30, Buffet Dinner 6pm-7:30pm and the play starts at 7:45pm Real Estate by Allana Harkin Emma – an incredibly determined realtor – decides that Joel is as much of a “fixer-upper” as the house he lives in. With the addition of Joel’s soon-to-be-ex looking to get divorce papers signed and her “man purse”-toting beauty entrepreneur boyfriend in tow, Emma focuses all her considerable energy into developing the curb appeal of the house – as well as its inhabitant. Living Life to the Full is an eight-week course designed to help people face and overcome the problems that are bothering them. Living Life to the Full is for people experiencing depression or anxiety and also benefits anyone seeking to worry less and live a happier life, starting now. This is a free course. To learn more or to register, please visit our website at www.reddeer.cmha.cahttp://reddeer.cmha.ca/living-life-to-the-full or call 403-342-2266. Applied Suicide Intervention Skills Training (ASIST) is a two-day intensive, interactive and practice-dominated course designed to help caregivers recognize and review risk, and intervene to prevent the immediate risk of suicide. It is by far the most widely used, acclaimed and researched suicide intervention training workshop in the world. Attending a two-day ASIST course will train you to intervene with an individual who is suicidal. The cost of this workshop is $250. To learn more or register please visit our website at www.redddeer.cmha.ca or call 403-342-2266. WRAP™ is an eight week course that helps people incorporate wellness tools and strategies into their lives. Thousands of people, world-wide, have successfully used what they learned during a WRAP course to live happier and more satisfying lives while improving connections to their families, their friends, and their community. This is a free course. To learn more or to register, please visit our website at www.reddeer.cmha.ca/wrap or call 403-342-2266. Celebrity Dancer Alex Wood mistaken for 2nd pro on the floor! This dentist has a sweet tooth for the dance floor! Will Red Deer finally get a seat at the adult table? Do we want a seat at the adult table? 3 wards for the city based on federal and provincial governance models.